We can finally do dishes! Short list but quite a bit to tackle. Getting water to the cabin proved a little more difficult that we thought on purchase day. 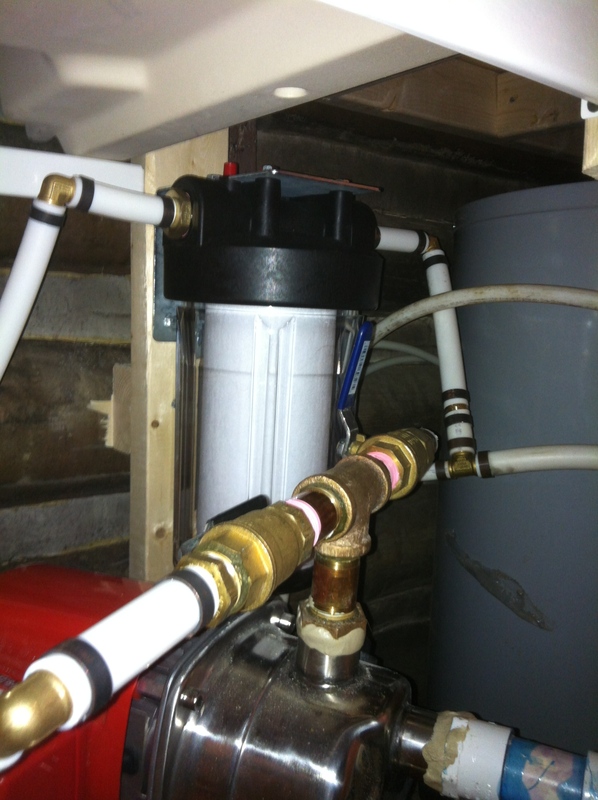 Although the gravity fed spring cistern and tank were full, the original owner’s pump wasn’t in working condition. 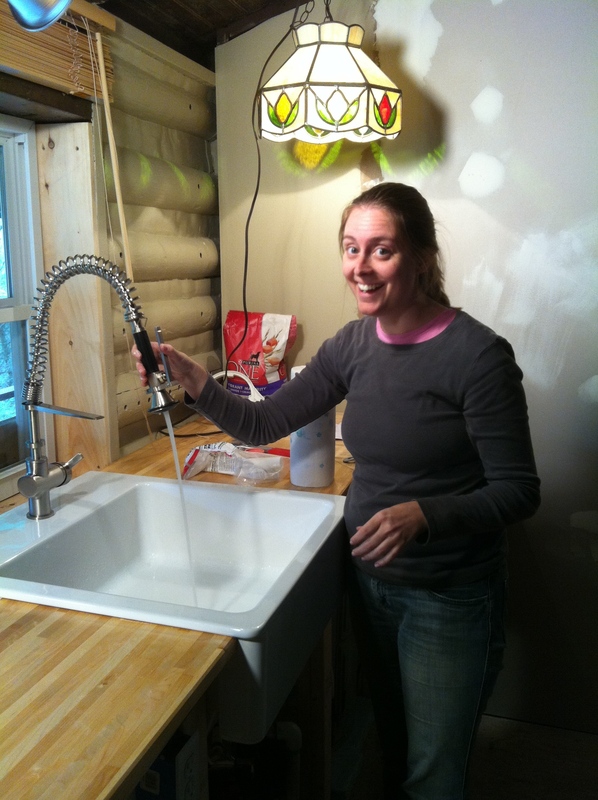 After some impromtu plumbing lessons that included learning how to use PEX pipe and compression fittings, installing the water pump, draining the tanks under the cabin and hot water tank, and installing a whole house water filter for sediment, the water was FINALLY flowing to the cabin. Yes, there was a happy dance involved. No, there is no video. The first showers were soooo worth it. The original owner's kitchen was a simple L-shaped counter that was open with the water pump and hot water tank underneath. Oh yeah, there was a lot of scary stuff on top of it too. 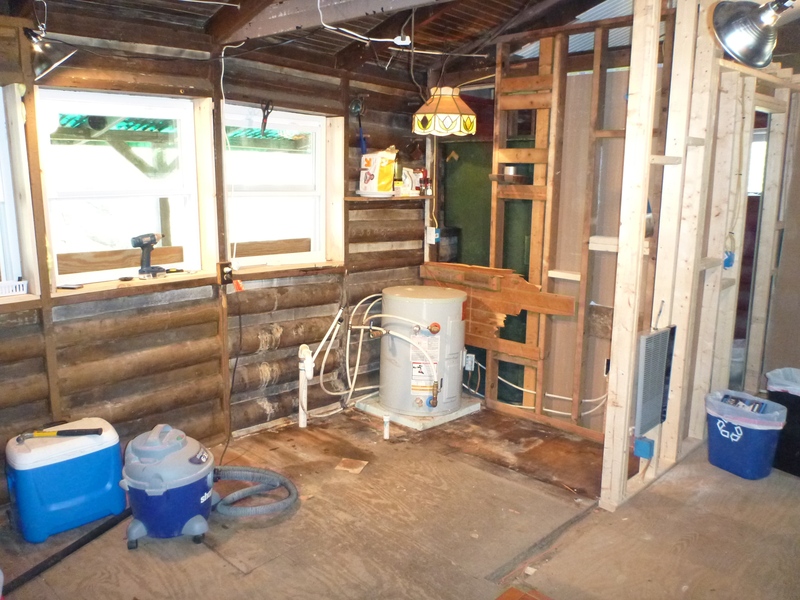 It was easiest to strip the entire cabin down to the bare bones and build up. Once the new water pump was installed and I figured out how to use PEX pipe, my first major plumbing accomplishment was to install a whole house water filter in the cabin - I've hung this picture prominently in the bedroom I'm so proud of it. I really, really, really wanted to build my own kitchen cabinets. I had researched plans and how-to for weeks. I have serious crush on Alaskan homemaker Ana White and her community of home how-to builders, plans and terrific projects. 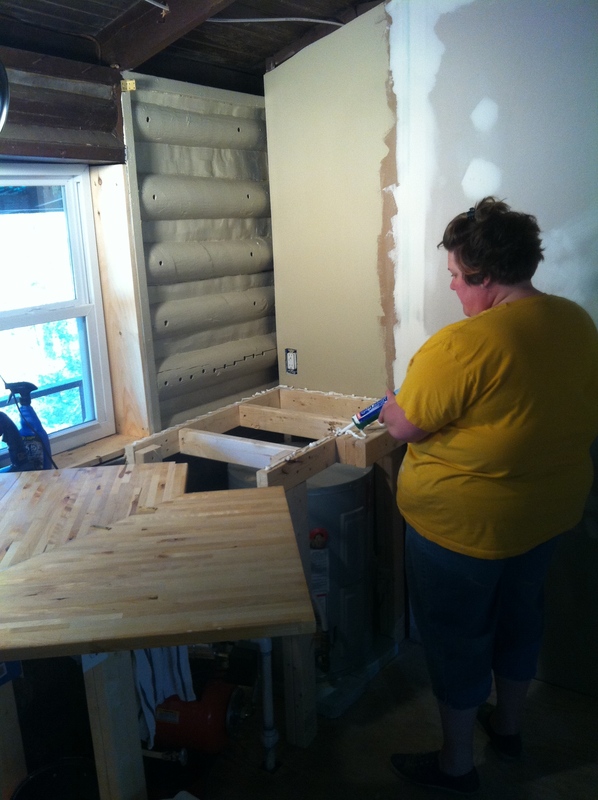 Her momplex project with clear and concise kitchen base cabinets empowered me to build my own. 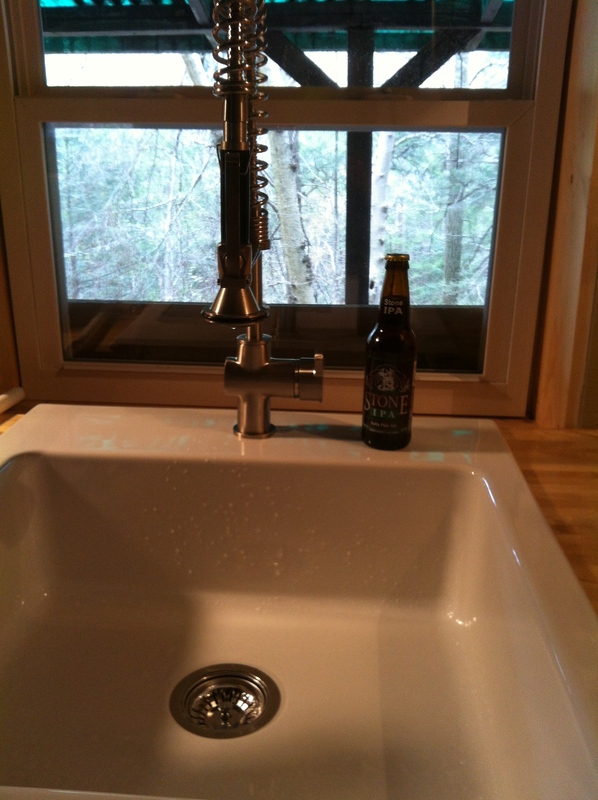 Except we would have had to completely change the plumbing in the cabin to have cabinets. 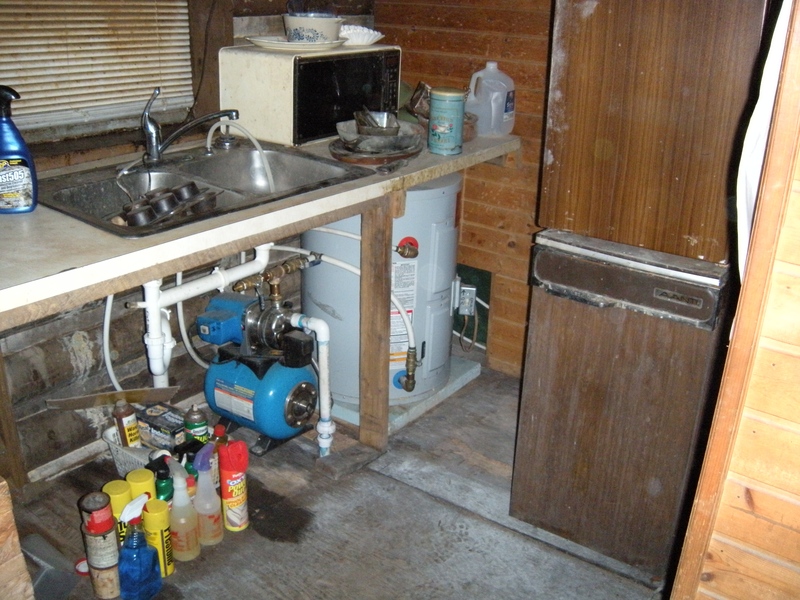 The original owner installed the water pump and hot water tank directly under the kitchen counter. In the absence of some serious plumbing skills, money, and pure ambition, the plumbing was all staying put. The plans changed to building a counter around the existing plumbing and installing cabinet faces later (god bless the annual tax return). Hey – get your mind out of the gutter – this all in plans of washing dirty dishes…. The countertop is Ikea’s Varde countertop – a birch butcher block top that comes in two different lengths that may be cut to size. The advantage of this was that we could cut our own countertop to size at a relatively low cast rather than ordering custom countertops. The butcher block birch is typically oiled like most wooden cutting boards. We elected to put several coats of polyurethane on the counter instead for a nice sheen that is easily cleaned after each use. If you elect to use polyurethane, it’s worth the time and effort to lightly sand between a minimum of three coats. The results are a smooth surface that will cause even the most uninterested to rub their had affectionately across the counter and grunt something along the lines of approval. 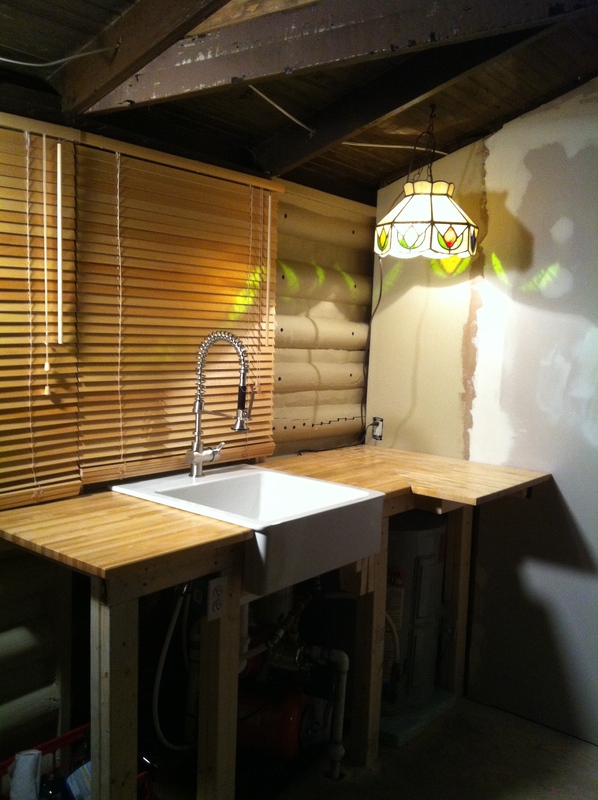 From the start we wanted a white apron sink with an industrial faucet. The best value we found was Ikea’s Domsjo sink bowl which comes in three shapes and sizes. We considered several faucet models and after many weeks of “which one do you want?” decided on our this is the last time we’re going to Ikea ever stainless steel Hjuvik kitchen faucet with hand spray. We have water! We have water! Our countertop is not at average height for most people – it’s at average height for people topping out at six feet tall – and we love it. Measuring at 42″ high, it rests just above the window sill from which the new dishwasher will be able to gaze lovingly down to our favorite trout stream. We cook – really well. Want to wash our dishes? We’ll feed you. ← We’re supposed to relax here, right? Wow, Jen! You are amazing! 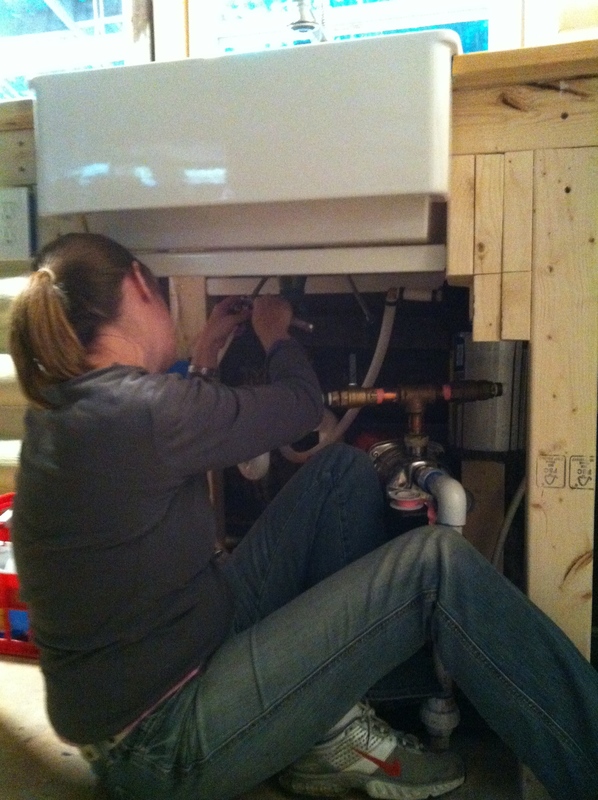 I bow down before your handy-woman expertise.